Friday started with gloomy weather and rains, and it was raining all night, also in the weather forecast they are predicting a 100% rain tomorrow, so no outing on Saturday. This week I made a bread Pain de campagne. For that I needed to make levain, and used half of it, rest I don’t want to throw it away. So decide to use it in this dinner rolls, thus levain dinner rolls were born. Yes it is delicious, I asked my hubby to make Pav bhaji, a mashed potato filling which goes well with it. If you wondering what is levain, it is a bread starter made with sourdough or wild yeast. To make levain, water, flour and sourdough are mixed together and sits aside for several hours of days to develop flavor and strength. Good levain produce good bread. A well-ripened levain will be bubbly, and extremely elastic. I needed levain to make pain de campagne, I used the recipe from Ken Forkish “Flour, water salt and yeast”. However he used only ½ of the levain, rest of the levain is thrown out; I don’t like that part, so decide to make the dinner rolls. I made it eggless dinner rolls, with levain, flour, water, and little yeast, salt, and sugar, milk powder and potato flour. First made the dough with levain and rest of ingredients, and did 4 folds at every 30 minutes during first hours of mixing. Then I did an overnight proofing in refrigerator. Next morning, I shaped it and proofed once again and baked into 350 °F preheated oven for 35-40 minutes. It is delicious has soft crust and tight and chewy crumb goes well as any sandwich. 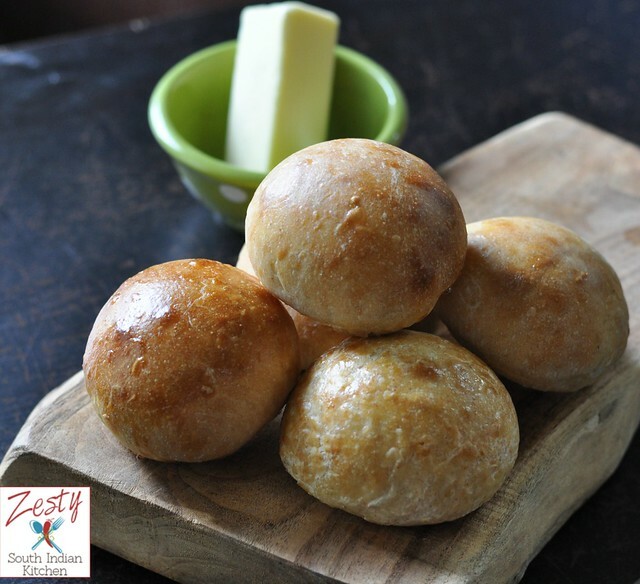 Excellent to make it as sliders, we enjoyed with Paav bhaji, a spicy vegetable medley that goes well with fresh bread. The bread used with Paav bhaji traditionally is white soft sandwich bread like this one. 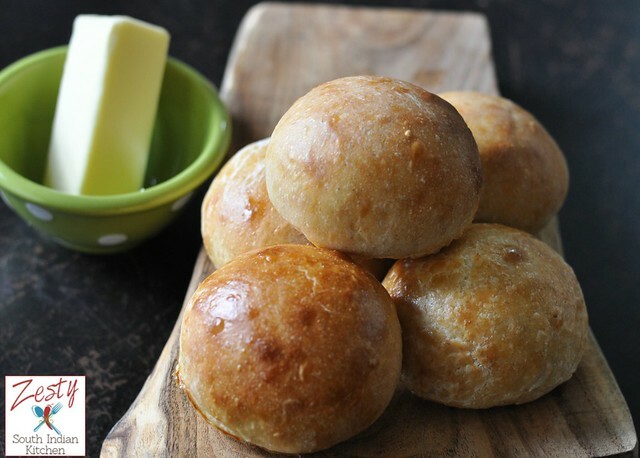 I liked the taste and flavor levain dinner rolls. If you are fan of sourdough bread like me then give it a try, it is really delicious, you won’t believe me until you make it. I made 10 dinner rolls, and got finished within a day. My 2 year old son also enjoyed it thoroughly; it was really cute to see him eating the slice of bread with little ketchup. Yes ketchup is their universal sauce; they don’t know to eat anything without it. My hubby teases me that I need to buy shares in Hunt’s ketchup company. 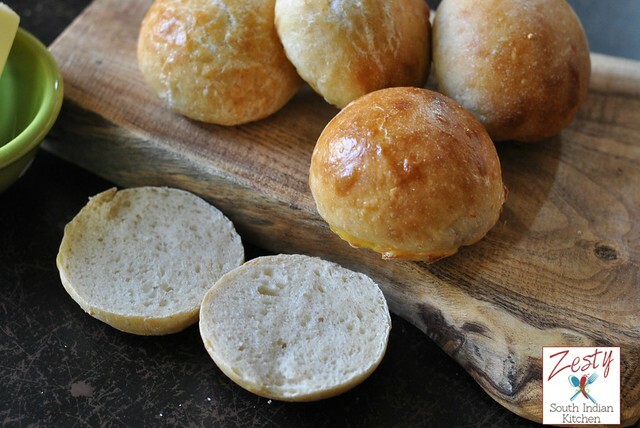 Delicious dinner rolls made with levain make it more flavorful . set aside for 6-8 hours at room temperature before you mix the final dough. In a 12 quart plastic container mix all ingredients for the buns, except, salt, levain, butter and yeast. and set aside for 30 minutes. once again for 30 minutes to do a second fold, continue this process until you finished the 4 folds. Set aside the dough into refrigerator for overnight. set aside for proof /double for 45 minutes. While dough is proofing preheat the oven to 350F. and bake them for about 35 minutes or until they become golden brown in color. Remove from the baking sheet and cool for an hour and enjoy as much you want. Linking this to linky parties, and yeast spotting. These rolls look sooooooooo inviting!! Oh, such cute buns! The size is just right for kids and adults, too. Thanks, Swathi!! Looks so perfect and tempting!! They look so very beautifully baked …YUMM! 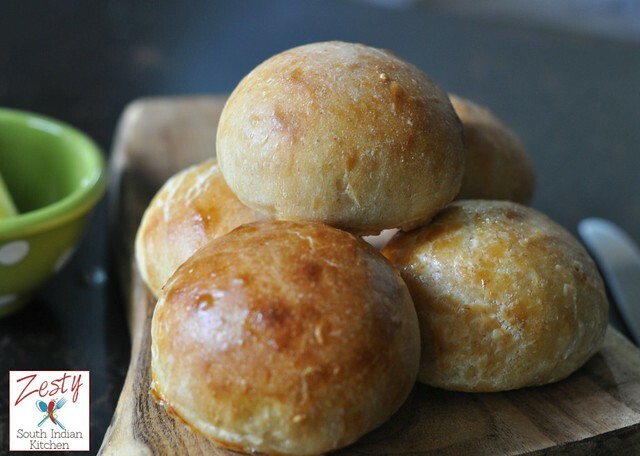 Swathi, these rolls look gorgeous! I love making sourdough bread (I named my starter Gracie) and have been thinking about making rolls this week. Today I’m making a large boule, tomorrow maybe rolls.